We are all very busy, and sometimes the smallest tasks seem like death by a million paper cuts. As a Project or Case Manager, reporting can be one of those bazillion tasks that you have to do each day that drives you up a wall. Why can’t it be easier to get to the information I want to see? It can be, nay, it should be! In our newest releases of CVLynx for eDiscovery, Document Review and Litigation Management, our report features make it easy to find the information you need to see. And by easy, I mean effortless. Passive Reporting (non-active) is one of our newest features in our Review Admin module, and it allows team leads to see, on demand, review progress, review stages (# in review, QC, Priv, ready for production, etc. ), tagging progress, reviewer-centric metrics on speed, accuracy and throughput, mass updates per day, TAR progress, etc. These are dynamic, out-of-the-box reports that run in the background and are available to team leads at all times within the Review Admin console. No longer do Review leads have to create 10-15 saved searches, run & QC them every day. Passive Reporting allows you to view important stats and metrics without any input on your end. All you have to do is look at the information in the Review Admin console. 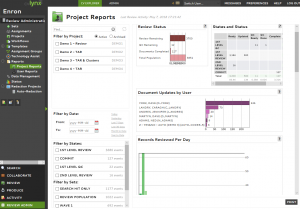 Dashboards are another great feature in CVLynx. Interactive dashboards are essentially a visual way to run a search, which can be really helpful for users needing to get to information quickly. 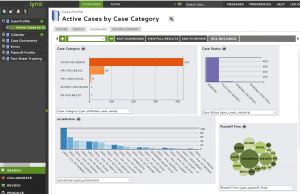 For both eDiscovery and Litigation Management, all sorts of dashboards can be configured to display data and allow for one-click filtering. Click on the part of the visual that interests you, and a filter is run to refine your dashboard to show just what you are interest in. Which is visual searching at its best. CVLynx users can setup and share dashboards with other users, making collaboration amongst various teams a snap. We know that visuals can often tell a story better than a search results, so our newest tools offer our clients many variations of presentation to tell better stories. Once these dashboards are set up, users can dynamically refresh these with new updates and the sharing ability means some users don’t even have to setup dashboards at all, they just start using them. Another passive reporting feature we have for our users is subscription reporting. Mostly utilized with our Litigation Management tools, this reporting tool allows team leads to setup reports that users can subscribe to and have delivered on a schedule each day, week, month or quarter. This way, users themselves get to decide what info is of interest to them – when new data is added, when changes are made, when new calendar entries are created or changed, or a digest of what is in the system. Once you subscribe to a report, the report is generated on the schedule you request and the report is delivered to your email inbox on that schedule. This is also a great tool for team or case leads – they can setup all the reports their teams require and automatically send them on whatever schedule they want. This frees them up from having to create and send daily reports. These are just some examples of the passive reporting CVLynx offers. At TCDI, we are constantly on the lookout for efficiency gains for our clients and our own teams. We have found that taking away the need to create, run and distribute reports can add back some much needed time to the day and relieve some unnecessary stress and frustration. 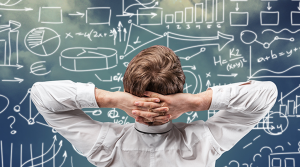 Just like in document review with our ‘set it and forget it’ workflows that manage the path of a document from one review stage to the next, passive reporting allows a case or team lead to set up reports or dashboards once and then sit back and let CVLynx do all the work.